Never let it be said that I'm not up for a good ol' KAL from time to time, especially when that KAL involves mittens. Ok, those of you who know me well know that there's no better way to turn me off a pattern than a KAL, replete with deadlines and stress and other fun things like that (why does the Mystery Stole 3 KAL of a couple of summers ago come to mind?) This one, however, is different, mainly because nearly every month is NaKniMitMo around here. A whole month devoted to the celebration of the mitten? I didn't have to be asked twice! I have a wealth of mitten projects lined up for this month (yes, including TWO NEW SpillyJane patterns,) and so far I'm moving along at a good clip. Let's see how many I can bang out in a month! Just last night I started Give A Hoot and this afternoon I polished off the first mitten: I suspect that this is a new personal best for me: a mitten in less than 24 hours, with eight of those taken up by sleeping? Amazing! Oh, the things that are possible when one is using 5 mm needles and not teeny 2 mm ones. But a mitten in less than a day? I can get used to this. 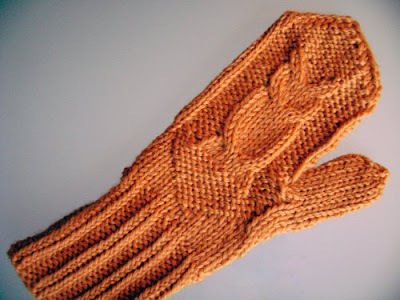 With any luck, the mitten's mate should be turning up in some form (hopefully completed) tomorrow. Watch, now that I've said this, I won't even make it past the cuff. We'll see! Also: check the new user pic! Check it!! January 5, 2009 at 7:45 p.m. This turned out so cute, have to put these on my list to make!! January 5, 2009 at 9:12 p.m. I love the new user pic. It's a little Deb from Napolean Dynamite. January 6, 2009 at 1:08 a.m. I love these mittens! I'm glad you're joining us in the kal. I really thought of it as a complete celebration of mittens too! January 6, 2009 at 2:35 p.m.
Love the new mitt. Have fun with the KAL! January 6, 2009 at 5:01 p.m.